While I have done many posts on communication in the classroom, I use many different sources, so today I'd like to combine all of these sources into one post to share with you! Probably one of the most popular communication supports used in classrooms with these special needs children is PECS. Pictures can be easily made using the software, "Boardmaker," or from the web-based program "Symbolstix." Both must be purchased. Pictures are typically stored in an individualized binder or folder that the student can easily access, and are categorized and/or color coded. Now don't expect to just hand all of these pictures to a student just learning this system. It has to be explicitly taught (check your district or with your SLP for possible trainings) and pictures are introduced gradually! Students will begin with 1-2 pictures. While I have both Boardmaker and Symbolstix, personally, I prefer real life pictures like you see above. I feel that my students respond better to real life photos and I've noticed that one thing all non-verbal children seem to have in common is that they LOVE looking at real life pictures! I'm gradually converting my entire classroom to real life photos for my rules, centers, token system, everything! I currently use the Go Talk with one student. As you can see, it comes in many different sizes, and even larger than shown. My current student uses the 9+. You can program it for up to 5 different inserts. She currently has only 3 in use; one for coin naming, number naming, and requests. Now, one important thing I must stress with this and really any communication device.....is DO NOT ALLOW THE DEVICE TO TAKE THE PLACE OF THEIR WORDS!!! IF THEY CAN SPEAK, REQUIRE THEM TO SAY THE WORD SIMULTANEOUSLY WITH PRESSING THE BUTTON, GRABBING THE PICTURE, WHATEVER. AND.....don't use pictures or supports for ANY word that they can say intelligibly!!! If they can say the word intelligibly, they don't need a picture! I was very fortunate to get this for two of my students two years ago! 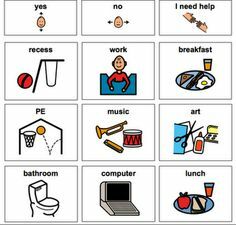 To me, it is the most powerful communication device out there for the non-verbal student (other than not having real life photos :-)). The sky is the limit with this app! But unfortunately it was not for these two students! One of the students was so tech-savvy that she would somehow manage to wipe it out almost daily. She would get into the settings and mess all kinds of things up! It became a nightmare. On the other hand, the other student just simply refused to use it, because he didn't see himself as different. He didn't get that people couldn't understand him. I currently use these with the same two students mentioned above and they love them! They each have two; one for home and one for school. They have been very successful with this support! These each hold 24 photos, but I'm sure you can get them to hold more! These seem to work well with the older boys especially, as they feel important having their own wallet! For communicating with my students that have the ability to speak intelligibly, but just don't know how, I use communication scripts. These typically work well with Autism students that do not know how to express themselves or engage in dialogue. This is a script that I use with my student Zoe every morning. She is now able to greet me without the script, so we are working on changing it up. This is important as she only knows what to say if the person speaking to her says, "How's it going?" If they say, "How are you?" she doesn't know what to say. This support introduces them to dialogue exchange and the nature of back and forth conversation, while also decreasing the verbal prompting. This child has a binder with scripts for just about everything. You can read on this in greater detail by visiting this blogpost. Knock Knock jokes are a fabulous way to engage students in dialogue! I introduce a new Knock Knock joke every Monday in my classroom and then we practice it each day that week and take turns doing each part! If you have a subscription to News-2-You, they provide a new knock knock joke each week that coincides with the weekly theme. I started "Question of the Day" just this year and I'm loving the results! Each day I post a question on the board. For example, it may be "What did you have for dinner last night?" I start! I choose a student and I ask them the question. They must answer me back in a complete sentence in a clear and sound appropriate manner. They practice good speaking skills by keeping their hands away from their mouths, sitting up straight, and so on. So they would say, "I had _______ for dinner last night." Then they get to choose a classmate to ask the question to and we go around until everyone has had a chance. Students may create their own question if they like. Students that are non-verbal, participate with prompting or by using one of the communication device/supports that I discussed above. I also use many of Super Duper's games and fun decks to engage my students in communication. They have some really great communication resources! Now....I saved sign language for last! Why?? When I first started teaching in my current classroom, sign language was heavily used. I quickly ran out and purchased the book and began teaching myself all the signs! I was also teaching new words to my students daily. Then, I received a visit from our area Assistive Technology rep and began to inquire with her about sign language training. She immediately replied, "Oh, our district doesn't support sign language in SDC classrooms." I immediately thought, "WHAT? That's not right!" But then she explained it....and it made sense...and has now changed my opinion of using sign language for my students! What she said is that while we understand sign language in the classroom....do their parents and family members at home? And while I said, "Yes, I've sent home the signs we learn each week. I've taught them." She then said, "What about the community? Will McDonald's know sign language? Will Walmart know sign language? Will their local grocery store understand sign language?" I was speechless for a moment, but then realized how right she was! I was enabling my students! While some of my students still use signing in my room because they previously learned it....I no longer teach it or use it myself to communicate with my students. As for communication in the classroom, there is no "one size fits all." As you can see, some students may take off with a system, while another student wants nothing to do with it. It's all about finding what engages each student and individualizing it to meet their needs. What supports have been the most meaningful means of communication in your classroom? I enjoyed reading your post about all the ways you help your students communicate. I teach in the same district as you. My son entered the KIDS program at 3 using sign language as his main form of communication besides pulling and pointing. We quickly learned that he hated using PECS, so we had to find an alternative. We ended up getting him Proloquo2go on an iPod that he used for a few years. He then switched to Sonoflex on a Samsung Galaxy Player. Just a few weeks ago, we bought him a HTC phone (no plan/card/basically a player) and TalkTablet to it. Best device he's had so far! I have a picture of it on my most recent post if you're interested in seeing it. Thanks for all that you do for your students! Very informative article.Thank you so much for sharing these information. Hi, My Assistive Technology Dept. provided my wallets. I'm not sure where they got them, but if you'll email me at tracibender@thebenderbunch.com with a reminder I'll check with them and get back to you.